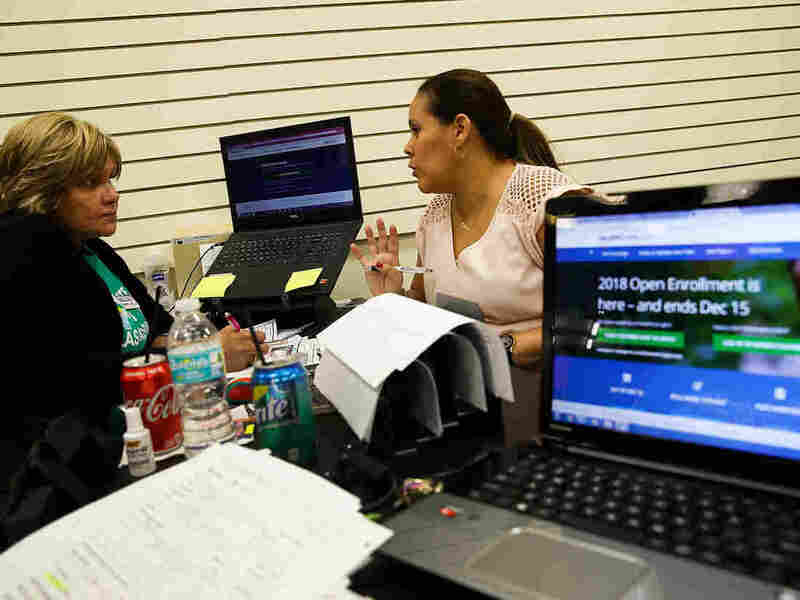 ACA Health Plan Navigators Feel Extra Pressure This Year To Bolster Sign-Ups : Shots - Health News With enrollment funding tight, health plan navigators and assisters are getting creative about getting the word out and signing people up for Affordable Care Act plans. Margarita Mills (left), an insurance agent from Sunshine Life and Health Advisors, helped Daniela Morales shop for an Affordable Care Act health plan at the Mall of the Americas in Miami last month. When Monica Spalding got the renewal letter from her health insurance company with premium details for the upcoming year, she couldn't believe her eyes. The insurer estimated that the share of the monthly premium that she and her husband would owe for their marketplace silver plan would go up from the current $28 a month to $545. She immediately called Sharon Barker, a health insurance navigator with Family and Children's Service in Nashville, Tenn., with whom she and her husband had worked this year to buy a marketplace plan after relocating from California to take care of her husband's ailing parents. They sat down with Barker at their local library and showed her the letter. Barker helped them run the numbers to determine that the tax credit they'll get for their health plan's premium next year will be much higher than the insurance company's estimate — more than making up for the increase in the cost of the insurance policy. The couple's share of the monthly premium for 2018 will actually go down, Barker showed them: from $28 to $0. "That's why we need these navigators," Spalding says. "If I didn't have Sharon, I would have just paid that increase." Other consumers may not find a navigator at the ready when they want to enroll. This year, the federal Centers for Medicare & Medicaid Services, which oversees the federal health insurance marketplace, slashed federal funding for navigator groups to $36.8 million — a 41 percent average cut. Some groups fared far worse than others did. In Tennessee, Family and Children's Service, the state's largest navigator grantee, received a 15 percent cut to its $1.8 million grant. Though it had to put plans to hire a couple more navigators on hold, in November its 22 navigators enrolled 2,082 people in marketplace plans, Medicaid or the federal-state Children's Health Insurance Plan, says Sandy Dimick, the navigator program director. The organization is on track to meet its goals for the open enrollment season, she says. Still, with outreach funding tight, Dimick says, she's worried about the people they're not seeing. This year, many insurers raised 2018 premiums significantly to make up for the federal government cutting off reimbursements for cost-sharing subsidies that insurers must cover under the law. Consumers who get federal tax credits to help cover the cost of their premiums won't generally have to pay more out-of-pocket. But, like the Spaldings, many may not realize that. "People are going to get those insurance letters and see the premium increase, and they won't come in," she says. "They won't go for coverage because they'll think they can't afford it." In addition to the cuts to navigator funding, the federal government also cut the advertising budget for open enrollment from $100 million to $10 million, creating additional challenges for navigator groups. In Florida, navigators are tapping "social influencers" to get the word out about open enrollment, including paying pro football player Julius Thomas of the Miami Dolphins to appear in a public service announcement video that is running in some television markets and on social media, says Jodi Ray, director of Florida Covering Kids & Families at the University of South Florida in Tampa. That $4.9 million navigator program covers the entire state and took a 15 percent funding hit this year. In Ohio, outreach has been just one of many services squeezed. Faced with a 71 percent cut to its $1.7 million navigator grant this year, members of the consortium of nine nonprofits that made up the state's largest navigator program voted not to provide services this year. Last year, that group — the Ohio Association of Foodbanks — helped nearly 10,000 people find health insurance. Other groups are doing what they can to step into the breach. Kami Perritt typically works as a patient advocate for a group of federally qualified health centers called Hopewell Health Centers in rural southeastern Ohio. But during the marketplace open-enrollment period, Perritt shifts gears and works as a certified application counselor, traveling between Hopewell's primary care offices in eight counties to meet with people who've made appointments to sign up for health insurance. This year, the increase in demand for such help has been "incredible," Perritt says. She routinely skips lunch to fit everyone in, and she estimated she's doubled or tripled the number of people she works with, depending on the site. "I've never been this busy," she says. "It's crazy." In addition to the shortage of people available to assist with enrollment, the open-enrollment period for federal marketplace states is six weeks shorter this year than last — running from Nov. 1 to Dec. 15. The issues haven't changed, though. In addition to reviewing the available plans, many people have special concerns they need help with. Sometimes it's a young adult who turned 26 and can no longer be on a parent's' family plan, or people who need to update their income and premium tax credit details, as the Spaldings did in Tennessee. Some people have application glitches that have to be addressed to prove their income or immigration status. So far, Perritt says, she's been able to accommodate all the requests for her help. But she's had to eliminate the enrollment clinics she used to run at county libraries to answer questions and sign up consumers. The Latino HealthCare Forum in Austin, Texas, took a 95 percent hit to its federal navigator funding — a reduction from $254,000 to $13,600. The organization was able to replace most of the cut with funding from the city and a foundation, says Jill Ramirez, the group's chief executive officer. Because the enrollment period is six weeks shorter this year than last, staffers have been able to concentrate resources in that smaller window, and are exceeding last year's enrollment pace. The group did make some changes, however. "In the past few years, walk-ins were welcome, but we can't do that anymore," Ramirez says. Now, people have to schedule appointments in advance for a set number of slots. "We're not going to help fewer people," Ramirez says, "but people will have to wait longer to see us."